We’re fast approaching that time of year where it feels like we have visitors over all of the time. Whether it’s family or friends, our homes are a hubbub of activity during the holidays, and while we frantically rush to clean up our homes before Cousin Teddy stops by with his family, we often feel at a loss. If you’re like me, you rush to dust, vacuum, and jam as many items into the closet as possible. No matter how many times you tell yourself that it’s going to be different, that last-minute dash to spruce up the joint is habitual. I don’t know about you, but when I’m racing against the clock to rid the house of dust mites, there’s one room I always forget to tackle: the kitchen. I’m usually good about cleaning the dishes and putting food away, but when company comes over, my kitchen isn’t much to look at. It’s dull. It’s boring. If I sweep the floor, the kitchen might look better, but it’s still a room in dire need of color. That’s why I’ve been compiling a list of DIY kitchen ideas. I’ve spent many hours sprucing up the home decor for my living room. When cleaned, I’m proud to say that the living room looks great. It’s comfortable. It has a sense of atmosphere and style. People can see all of my cool DIY room decor and be amazed. My kitchen, as you now know, is another story, and I wanted to change that. What if Cousin Teddy and the family wanted to raid my fridge for snacks and sodas? In looking for DIY kitchen ideas, I put together crafts that either looked great, were practical, or could wear both hats. Some of these crafts, like the Coffee Pot Homemade Terrarium, were also a neat way to recycle spare items I no longer needed. Featured below is my personal to-do list. 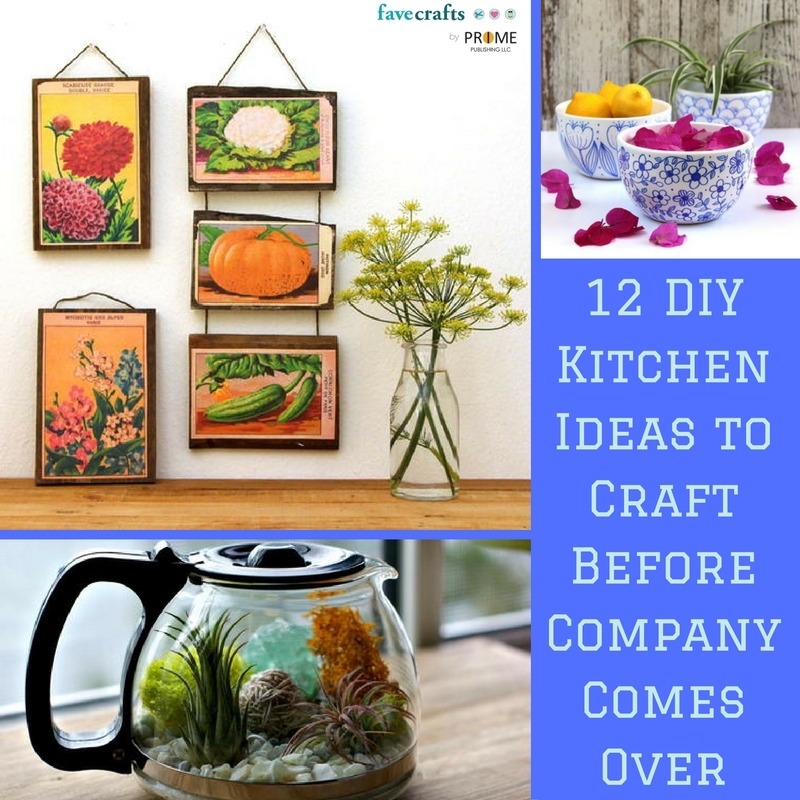 The next time those family members or friends want to check out my home, these crafts will make me feel like my kitchen is dressed up enough for company. If these 12 DIY kitchen ideas inspired you to track down some more neat projects, you should check out this 39 Low Cost Kitchen Crafts eBook. I’ve opened up about my last-minute preparations for company. How do you prepare for guests? Summer is here, which means kids are out of school and looking for stuff to do! Outside activities are always a great idea, but sometimes it’s just too hot for kids to be out and about. 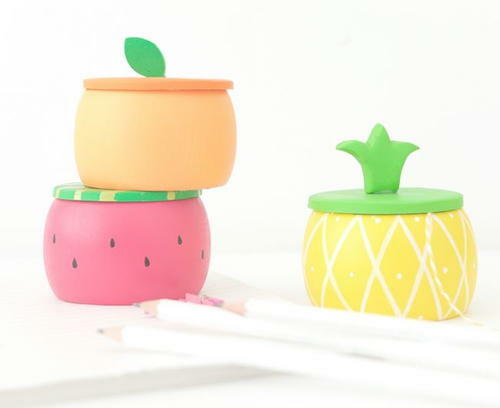 Instead of having them lose hours in front of the TV or playing some video games, why not engage their creativity with some kid-friendly, indoor crafting projects? Here are five fantastic crafting ideas that will keep your kids busy, and keep their imaginations running! Not only can duct tape crafts be a fun way to engage a child’s imagination, they can also lead to more imaginative playtime later on. 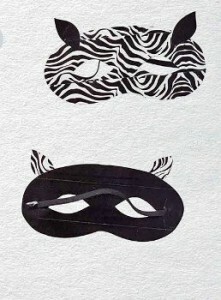 This zebra mask is very easy to make and may lead to your child running around the house for the rest of the day, pretending to be a wild animal! All you need is some of that new, zebra-striped duct tape, some regular black duct tape, and your handy-dandy craft knife. Simply create a mask-shaped form from your duct tape, cut out some eye holes, and add a string so your child can wear the mask. Hours of fun are sure to ensue! You can find more ideas for kid-friendly duct tape crafts in this round-up. What kind of crafty fun can your kids whip up for the kitchen? 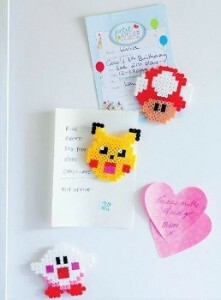 How about these fun video game magnets made from perler beads? Featuring Mario and Pokemon characters, kids will love these fun beaded crafts which can also double as coasters! 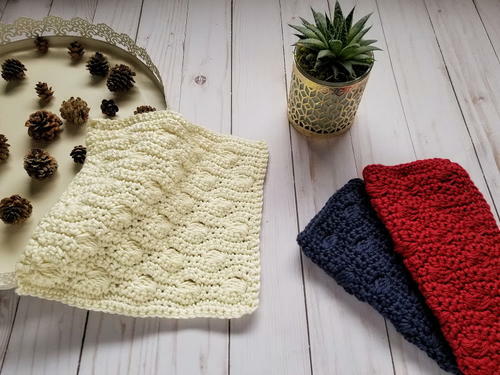 This beginner knit dishcloth is another great project for kids who are learning how to knit. Have your kids start off with larger needles to get them used to the basic knitting stitches. You can find all the information you need on teaching kids to knit at CraftFoxes. Some kids love video games, some love sports and some love reading more than anything else. The felt heart bookmark is a craft that you can do with your book-loving youngster and then let them spend their summer days paging through their favorite stories. 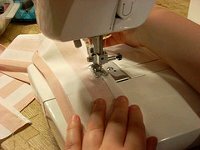 It’s a great project for a child who might also be interested in sewing. 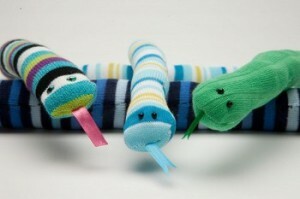 If you have any bright, striped socks around the house that are missing a mate, check out this easy sewing project for a snake sock craft. It makes a fun stuffed animal for kids and can be customized with colored ribbon and beads made from eyes or thread. For 10 more sewing projects for kids, check out this round-up from CraftFoxes. Is it party time yet? 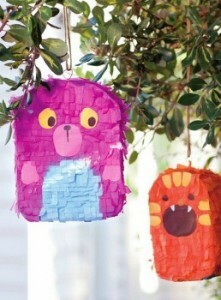 Learn how to make a monster piñata from recycled cereal boxes. You’ll just need to dress them up with colored tissue paper and drawn on the face. For some extra fun, fill the piñata with candy and let your kids take turns hitting it (under adult supervision) while blindfolded to release a sweet treat! If you have a full recycle bin in the kitchen, challenge your kids to create something crafty with empty milk jugs, cartons and boxes, like this space shuttle craft made from a recycled soda bottle, or turn it into a cool piggy bank with some bright pink duct tape. Another great way to pass the time in summer is origami, the ancient art of paper folding. These are great paper crafts for kids who are detail-oriented and are patient enough to sit with intricate projects for a while. Your kids are sure to love these origami projects, especially this Star Wars origami. Interactive origami projects for kids like a “talking” dog, a jumping frog and a giraffe who would be great for some afternoon puppet shows. The origami fish base is also a good place to start, since it will teach children some of the folding basics. 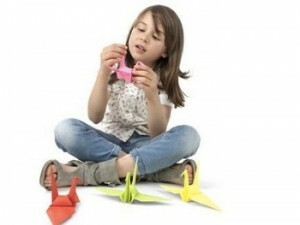 For more ideas, read this round-up of 6 creative origami projects for kids. 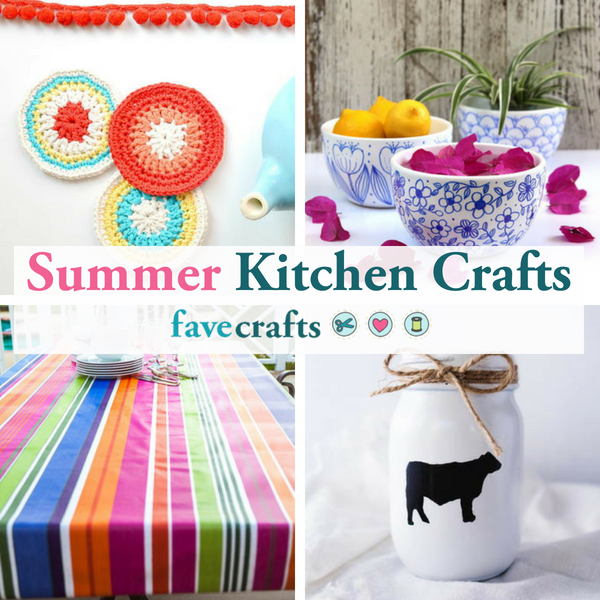 6 Cute Kitchen Crafts You’ll Love! I’ll admit, I’m not much of a cook. I can make pasta and eggs but anything out of that skill level is a challenge. My family will never let me live down the day when I burned soup. Who knew you could even do that? I didn’t, that’s for sure. The funny thing is that as hopeless as I am at cooking, I love to bake. Cakes, cookies, brownies, you name it I’ve baked it. I guess I like how scientific the recipes are, basically if you follow the directions you end up with a delicious treat! This summer, I’m moving into my first apartment and I’m excited to have my very own kitchen to let my baking fantasies run wild. The kitchen itself is a little drab but I know with some cute crafty projects I’ll be able to liven the decor up a bit. 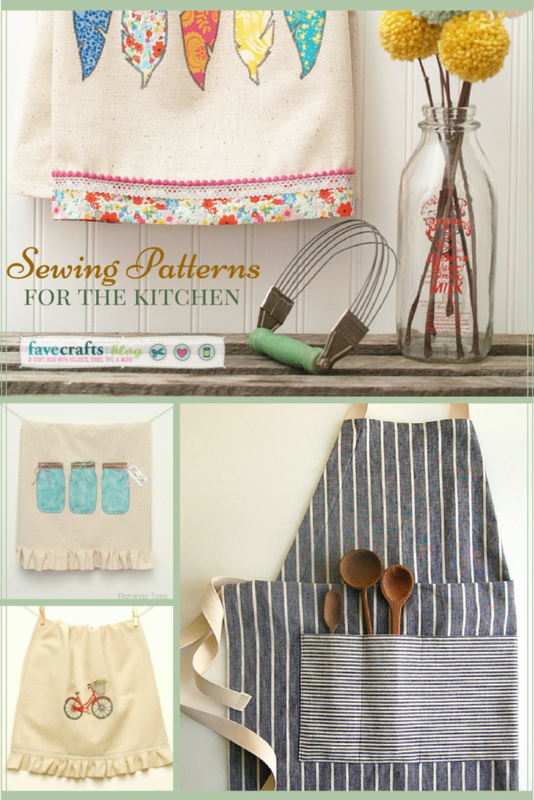 That’s why I’m loving these quick and easy pot holder sewing patterns. Not only are they practical but they will look great hung on the shelf over my sink or even just on the counter. 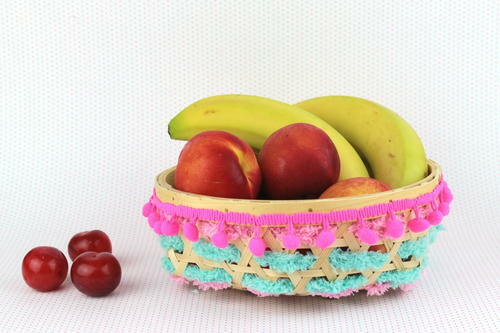 Just looking at these cute potholders makes me want to bake. Or even learn to cook! “Let’s Eat” Potholder – I’m in love with the fun applique utensils on this pot holder. Not only does it have a pocket for my hand but it’s so cute it makes me want to cook something! Retro Potholder – Right now I’m really into anything with a vintage or retro feel. This pot holder has a fun pattern and colors that remind me of the 60’s and 70’s. You Are So Hot Potholder – This is such a clever pattern. It’s silly but it’s sure to make you smile every time you see it. I’m a sucker for puns so I think this pot holder is hilarious! Double Potholder – This potholder is longer than most and protects your wrists and part of your arm from the heat. It’s great for me because I’m not the most graceful when it comes to maneuvering pans out of the oven. Polka Dot Pot Holders – Polka dots are such a fun pattern and it makes these pot holders really pop! I want to make a set of these in coordinating colors to give to my friends as housewarming gifts. Dishtowel Potholder – These are made from dishtowels which makes it a thrifty pattern that’s really useful. 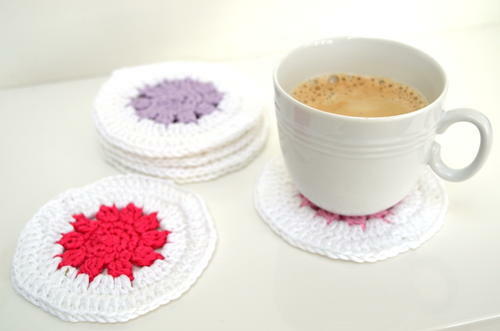 I’m going to buy some dishtowels from the dollar store to make these on the cheap. 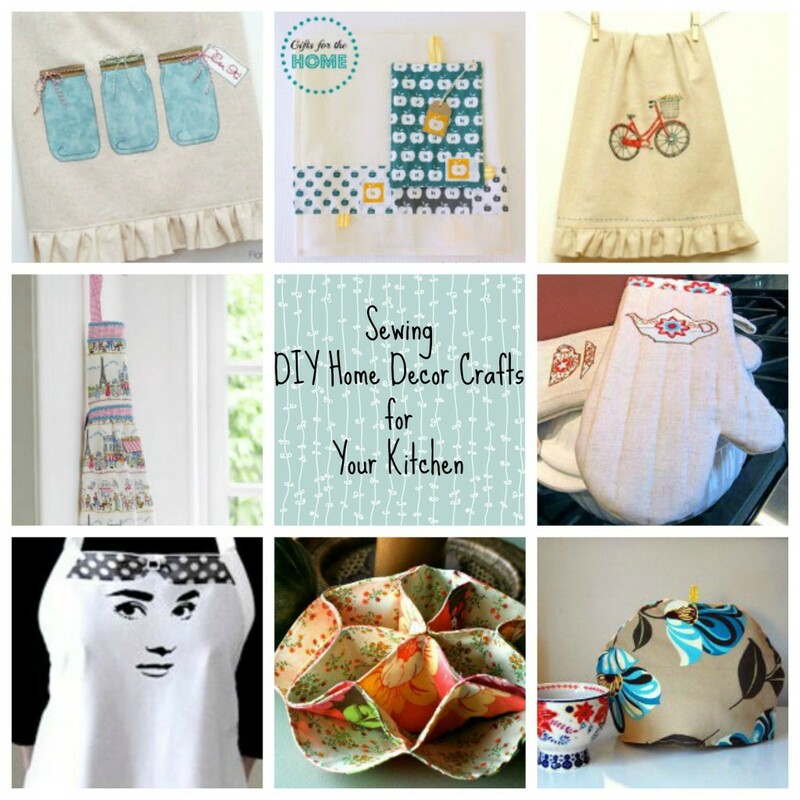 If you are looking for more easy sewing projects to add some spice to your kitchen you should check out these 10 Kitchen Projects: How to Make Potholders + 3 New Ideas. Which pot holder is your favorite? Share with us below! ‘Tis the season for watermelon eating! 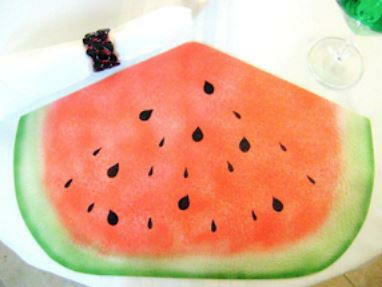 Along with enjoying the fruit in its natural state, why not make watermelon-inspired crafts too? 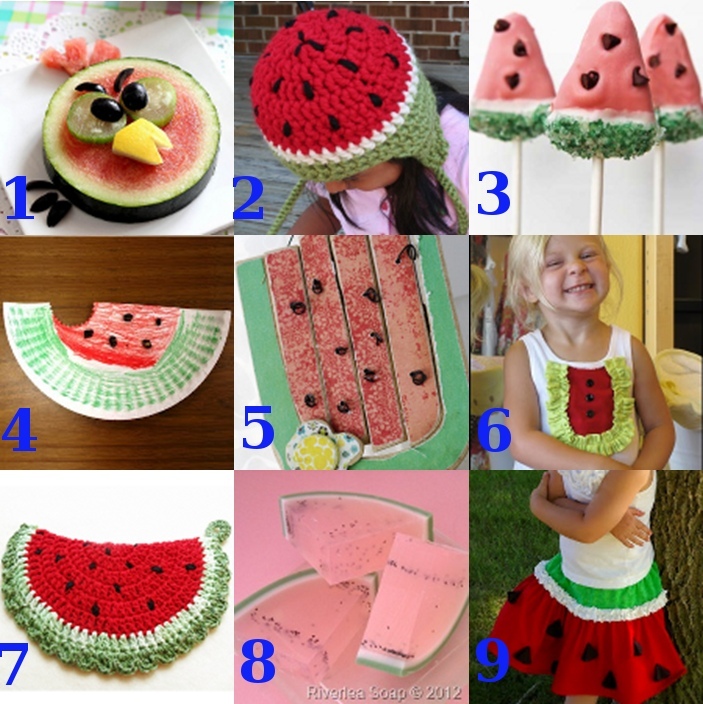 I noticed watermelons were popular lately on Pinterest, so I decided to round up some of the cool watermelon themed crafts I found, from crochet patterns and watermelon clothing to food that looks like watermelons and rustic watermelon home decor. Watch out for seeds! Scrap Wood Watermelon from How Does She? 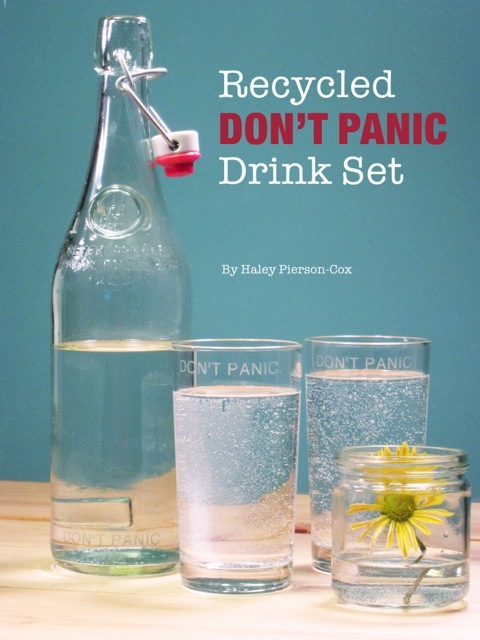 Welcome to the Geek Crafts column, your weekly dose of geeky goodness with Haley Pierson-Cox from The Zen of Making! My local grocery store carries fancy carbonated lemonade in old fashioned bottles with clamp tops, and it’s one of my favorite summertime picnic treats. The bottles are so cool that I can never actually bring myself to recycle them with the rest of the glass, so I’ve amassed quite a collection over the years. But, thanks to the wonder that is glass etching cream, I’ve finally found a way to give them new life! 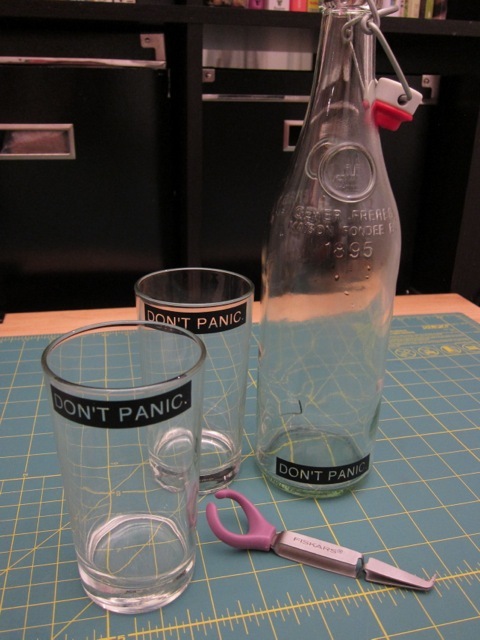 In this tutorial, I’ll show you how to combine a beautiful glass bottle with a pair thrift store glasses to make a fun Hitchhiker’s Guide-inspired drink set. It’s cheap, fun, and Earth Day approved! 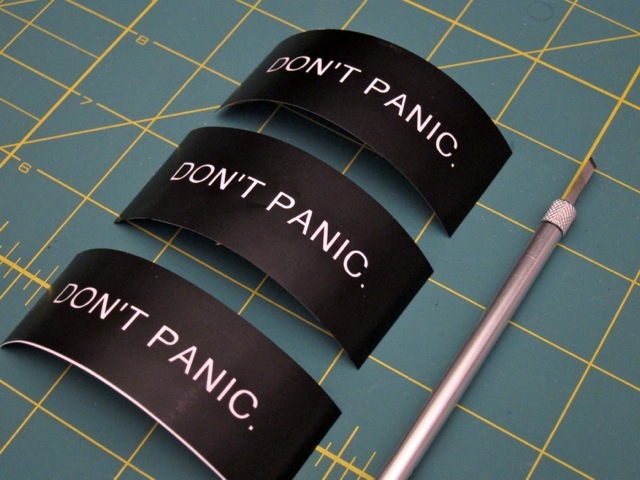 Trace “DON’T PANIC.” onto a sheet of adhesive-backed vinyl, then carefully cut out the letters using a craft knife. 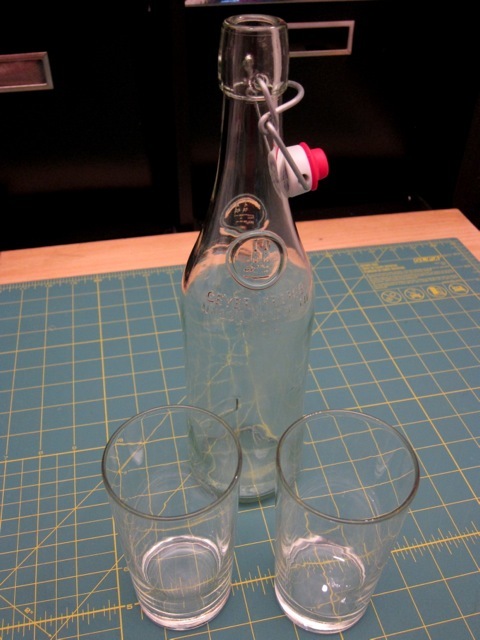 Thoroughly wash and dry the glasses and the bottle, then clean the outside surfaces with rubbing alcohol. Using tweezers, carefully apply the vinyl templates to the bottle and the glasses, making sure that the edges of the letters are cleanly adhered to the glass surface with no gaps or bubbles. Apply etching cream to the letters using a sponge brush. 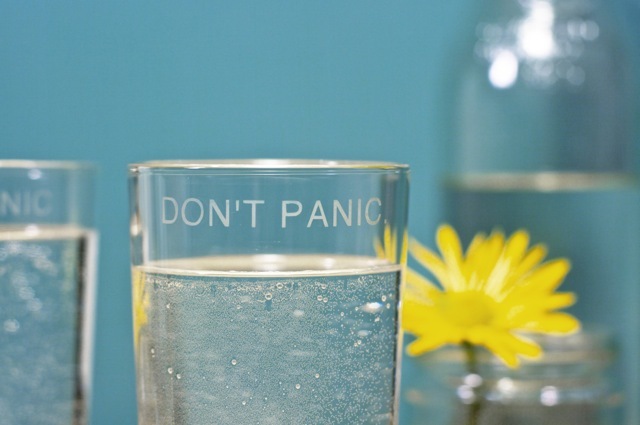 Follow the instructions on the container, and be careful not smudge the etching cream or let it run onto other parts of the glass. 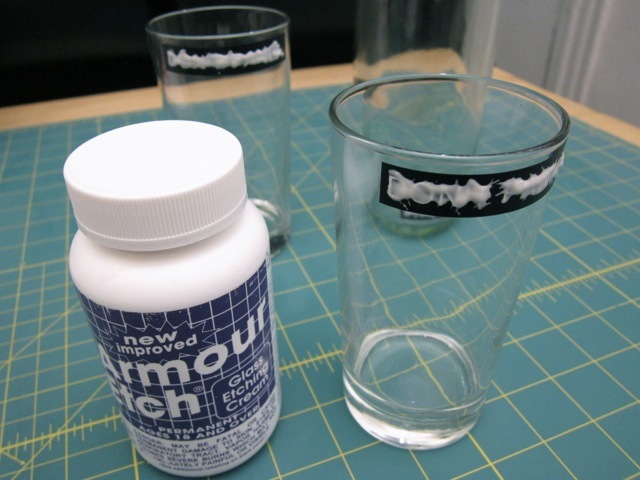 Once the etching cream has finished working, wash it off, then peel the vinyl template off of the glasses and the bottle. 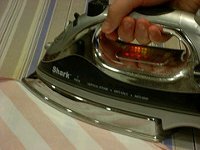 Once the vinyl is removed, wash each piece thoroughly before using. That’s all for now! See you next Wednesday for more geek craft fun! It’s easier for me to do a chore if I am first outfitted with the proper accoutrements. For example, doing the dishes is much more palatable if I have a cute new pair of rubber gloves. Sewing is more fun with a pretty pin cushion too, and don’t even get me started on how much the perfect 1950s housewife dress makes me want to vacuum. 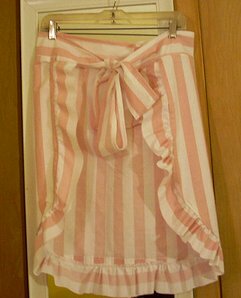 Baking and cooking are definitely onerous tasks for me, a clear kitchen novice, so what better way to motivate myself to put spatula to pan than with a cute new apron? 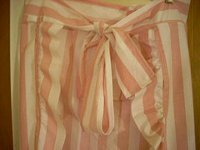 To make your own apron, all you need is a sewing machine, an iron, and some fabric (I used a vintage sheet again). 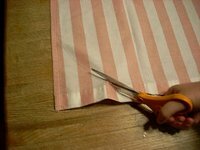 First I cut the fabric into the size and shape I wanted the front of my apron to be. I didn’t use a tutorial, so I just estimated and measured against one of my skirts. 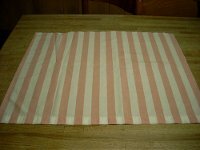 My fabric ended up being about 26″ wide by 20″ long, but as you’ll see at the end, it was a little too big. 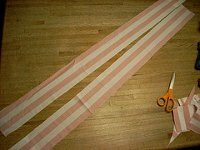 I also cut two strips that were 4″x45″ to serve as the waistband and tie. 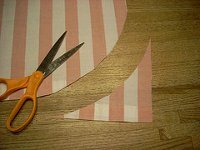 You could alternatively cut one 4″x90″ strip if your fabric piece is long enough. 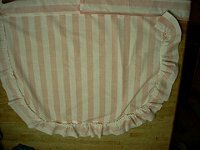 I wanted my apron to have a rounded bottom because I thought that would give it a more vintage feel. Since I’m not confident in my free-hand abilities, I used a large, round serving platter as a template and traced an arc to round the two bottom corners. And then cut along both corners to make the apron shape. 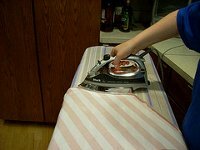 Next I ironed about 1/2″ around my apron piece and both waistband pieces so I could finish the edges more easily. Then I went ahead and finished the edges. 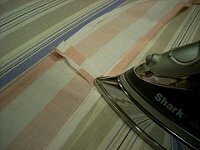 Do three out of four edges on the waistband pieces–leave one 4″ side alone on both because they will be joined together there later. Leave the top 26″ side alone on the apron piece because it will be joined to the waistband later. After all the edges are finished, it’s time to join the two waistband pieces together along the unfinished 4″ side of both. 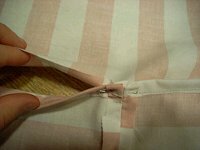 Sew them together with the wrong sides facing out, and then iron the seams down in the back. With both pieces of your apron finished, you can now join them together. Pin the edge of the waistband to the ironed (but unfinished) edge at the top of the apron piece with wrong sides facing out, and stitch ’em down! Now you may think we’re done, but, well, you’re wrong. 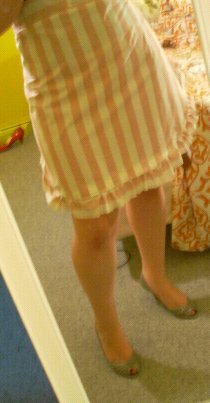 I mean, what’s an apron without ruffles?? 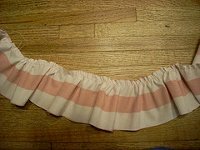 To make my ruffles, I cut another long strip of fabric that was about twice as long as the distance around the bottom of my apron (arc length? circumference? perimeter? I don’t do geometry…) and about 3″ wide. 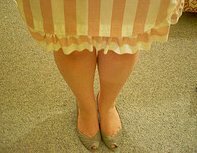 You may want to cut your strip longer because my apron did not turn out ruffly enough for my liking! 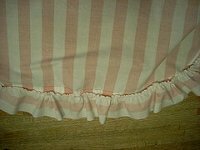 Next, use my How to Sew a Ruffle guide to turn that boring old fabric strip into a fabulous ruffle for your apron, and then pin the ruffle to the bottom of your apron. 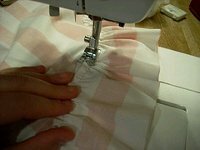 Stitch the ruffle down, and your apron is done! 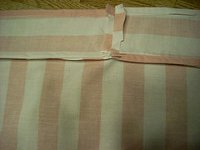 It was way too long, so it ended up being more of an empire waist apron! Do you wear an apron when you’re in the kitchen? Have you ever made one yourself? Your kitchen needs some lovin’ too so don’t ignore it. Spruce it up, add some decorations to it. Be brave and add some bold and vibrant colors. 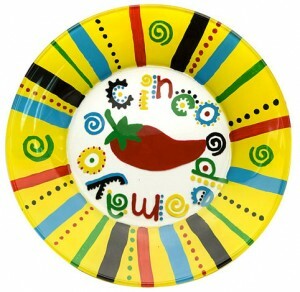 The Cinco de Mayo plate is perfect for your fiesta in May. It’s colorful and your guests will love it. The chili pepper is the center of attraction and it makes everything look so festive. 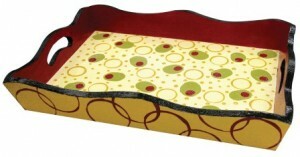 Another great piece to present to your guests is an olive cocktail serving tray. The pattern is adorable and you can leave it out all the time to decorate your kitchen. It’s a fun painting project you will love to do. 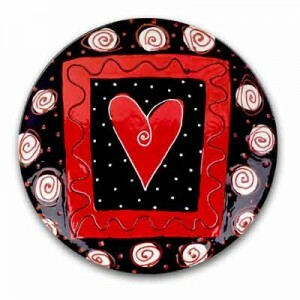 If you’re looking to decorate you kitchen walls then this decorative heart plate is perfect for that. Not only does it add some color, but it brings out your personality. This is a cute craft for the Valentine season too. If you have kids or if you remember when you were a kid then you know exactly what I’m talking about. Back in the day my mom and I would always put some kind of craft together. I liked painting and I liked making messes, so we would always find some kind of craft where I can do both of those. Every Thanksgiving we would work on a holiday craft, whether it was to give as a gift or decorate our home. We always went to my aunt’s house, so sometimes the gift would be for her. You first have to prepare by laying newspaper out as it will get a bit messy. Aprons must be flat on surface. Be sure you have wet paper towels and soap ready to clean hands at sink. 1. Squeeze and spread Burnt Sienna onto foam plate. 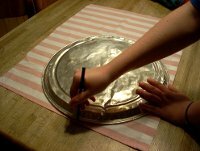 With fingers spread slightly, press hand flat into paint and then press hand flat onto apron bib area. If more solid handprint is needed, use small brush to lightly fill in hand shape. 2. Use 3/4″ pouncer brush dipped in Burnt Sienna to stamp random dots over apron surface and around handprint. Repeat with Cadmium Yellow and Festive Red Writers. Allow to dry. 3. Use Cadmium Yellow to create small triangle for beak shape on turkey head; paint lines for legs and feet. Use Festive Red to paint small heart-shaped waddle under turkey head and to paint words below turkey. 4. Use Black Writer to paint dot eye on turkey and curved line for wing shape. 1. Repeat same instructions as above, but assist with stamping handprint and use smaller pouncer brush when stamping dots on apron. This apron reminds me of a time when I was little. You can make this for any special occasion. My three sisters and I made a sweatshirt for Mother’s Day. I believe the only material we used was a sweatshirt, paint and puffy paints. 1. We poured the paint into a tin of some sort, of course it was sitting on a table covered with newspaper so it wouldn’t get too messy. 2. We stuck our hand into the paint to be sure the entire hand was covered. 3. We firmly pressed our hands onto the sweatshirt so the paint would stick and then slowly pulled our hand back as to not mess up the pattern. 4. Once our hands were dry on the sweatshirt we used the puffy paints to design the rest of the sweatshirt with squiggly lines and polka dots. We also wrote happy Mother’s Day on it along with each of our names next to our hand print. Keep in mind, this can be done for any special occasion. If you want to make a Thanksgiving sweatshirt or apron, you do the same thing. Get paint on your hand and make the handprint. Then use puffy paints to draw in the rest of the turkey. It makes for a nice homemade gift or decoration. 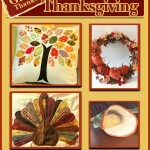 For more great Turkey and Thanksgiving crafts click here!